Everyone has wanted to have a dog as a pet sometime in their life. Due to their loyalty, loving nature and playfulness, dogs are some of the most common and most desired pets in the world. They come in a wide range of shapes and sizes with some small enough to fit in your bag and some as large as cattle and weighing more than a hundred kilos. 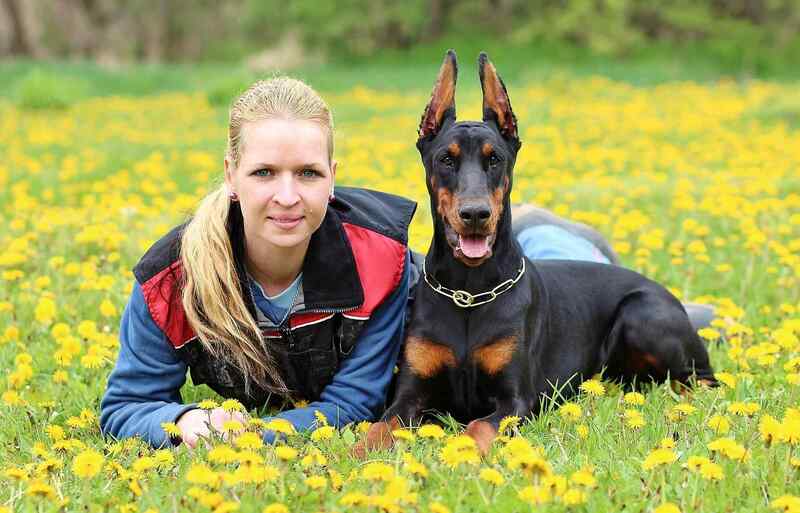 Along with best guard dogs, you should know about biggest dog breeds in the world. English Mastiff, Great Dane, St. Bernard, Neopolitan Mastiff, Irish Wolfhound, Leonberger, Newfoundland, Anatolian Shepard Dog, Great Pyrenees and French Mastiff are ten largest dog breeds around the world. Dogs are usually bred for a specific reason like hunting, guarding livestock, being show dogs etc. and here is our list of the 10 best guard dogs in the world! Originally bred in England by crossing a Mastiff and a Bulldog to protect against poachers, this dog is large and active. It is perfectly suited to guard large outdoor surroundings and is extremely loyal to the family. Due to its large size, it can easily overpower intruders – be they human or animal. Despite its fearsome look, it is an affectionate and brave dog, ideal as a house pet if you have a large farm to let it run wild. The breed was created in England back in the 1800s and developed by crossing the Bulldog and Mastiff breeds. It was officially recognised by the American Kennel Club in the year 1934. The breed is popular as intelligent, strong and powerful with a willing temperament, however, it shows love and affection if treated well. It has a unique sense of smell and can be very tolerant toward other pets but not towards the dos of the same gender. This popular breed originated in Germany and is widely known for its alertness and fearless nature. It has a lean and powerfully built body and carries itself with grace. It can reach great speeds and is very agile. Because of its obedient nature, it is widely used by police and armed forces all over the world. They have permanent marks on the chest, legs, muzzle, and bottom of the tail. The breed was developed in Germany back in the 1880s and it is actually a mix of a number of dogs i.e Rottweiler, German shorthaired pointer, Weimaraner, Manchester terrier, Beauceron, great Dane, black and tan terrier and greyhound. The breed is widely used as search and rescue dogs because of its intelligence. Because they are used as guard dogs, owners will dock their ears and tails because they can be pulled down during major operations. Also, they are listed as 5th smartest dog breeds in the world. The Rottweiler looks similar to the Doberman but is more heavily built. It is known for its agility, loyalty and guarding abilities making it one of the favourite pets on this list of best guard dogs. It is believed to have originated from dogs of the Ancient Romans and is a very old breed. It needs regular exercise and interaction with owners, not suitable for someone who prefers the sedentary life. The life of this massive dog varies from eight to ten years making it one of the shortest living dog breeds in the world. One of the smartest dog breeds in the world have been bred as guard dogs and hence they can form strong bonds with their owners. The breed loves to spend time with the family, so they should not be left alone for long. The breed is also known for their calm and confident nature. The breed requires intensive and powerful training from early puppyhood itself. This dog has a distinctive appearance due to its thick coat of white cord like hair which helps it to protect against cold weather and blend in with the sheep it protects. It is not a very common house pet and is preferred by herders with large enclosures to protect. This dog is known for its courage, loyalty and dignified manner and so makes it to the list of best guard dogs. They have an appearance of walking moping than a dog and it was originally bred in Hungary and mostly used to guard the flocks of sheep there. Since ancient times they are excellent guard dogs for the homes and families, however, their signature coat needs regular grooming and at the same time, they are loyal and obedient. The breed is related to the Pulis and is considered from Russian stock and one of the oldest dog breeds in the world. The large dogs are protective of their owners and families. Related: Top 10 Cutest Dog Breeds In The World. This Mastiff is native to the Himalayan Mountains and has been recognized as a separate breed less than ten years ago. It has a reserved and independent personality and is not very open to strangers. They have a thick coat of fur that sheds once a year. They are very intelligent dogs and widely used in colder regions to guard property and livestock. The breed loves to be outside and hence one of the best guard dog breeds in the world. They have impressive bark capabilities that they generally use in the night. According to a few surveys, two Tibetan mastiffs can easily take down a lion. It has a long and tall body and eyes have an appearance of an old man. It loves their family and owners and one of the most trusted breeds because they are guarding people and property for 2000 years. They love to thrive in the colder region, however, this doesn’t mean they will not able to sustain in a hotter climate. This dog is known for its large size and high energy. However, it requires proper training and plenty of mental and physical stimulation. It is very protective of the family and not friendly to outsiders. It’s alert, intelligent and brave temperament makes it one of the ten best guard dogs. It was developed in Germany back in the 17th century. Giant Schnauzer largest among three of its breeds. The other two breeds named as Standard Schnauzer and the Miniature Schnauzer. We have used Great Dane, the Bouvier des Flandres, and the German Pinscher in the development of Giant Schnauzer. The breed can stand up to 27.5 inches and weighs around 95 pounds. There are three kinds of schnauzers listed in the same breed, however, they have different sizes. It is developed in Germany in the agrarian kingdoms of Bavaria and Wurttemberg and initially working as a farm dog. Known for their smartness loves to do the job assigned to him with the help of their intelligence. These are the most successful dogs in areas such as military work, rescue work, dog sports, and even as guide dogs. We have also listed beautiful dog breeds in the world. A very well-known and popular pet, this dog was bred to be a sheepdog and prevent the flock from wandering off. They are intelligent, active and easy to train to make them a standard part of police forces. However, they are calm within the home and are suitable pets for a family. They are also originated in Germany. Along with police forces, they are also used in military roles, search and rescue and even in acting. They are formerly known as Alsatian in Britain. The German dog breed was raised in Germany back in the 1800s where they are working as Sheepherders and safeguarding them from the predators. The average life expectancy is 10.95 years with some breeds born with unusual colours and they are known as “Panda Shepherds”. Apart from the United States, the breed is popular across the globe for their services to military, police and service dogs. This dog is a type of hound bred to hunt lions but is now used mostly as one of the best guard dogs. It is independent, agile and affectionate towards the family though it needs to be properly trained. The Ridgeback is a very intelligent and alert dog that barks only when there is a real danger, and this should not be ignored. The breed originates from Zimbabwe and hugely popular across the world as a pet and a working dog. Talking about the appearance, it looks noble with a ridge of hairs running along the spines that makes them different from the other breeds. It is popular all over the world for their loyal, protective and loving with their families. It is naturally bold and confident that can lead them to be more dominant. The lifespan of the breed is approximately 10 to 12 years and weighs around 70 – 85 pounds. The Kuvasz is a large white breed with a lithe body and strong legs. It is loyal and fearless and has a strong protective instinct towards its family. This, along with its alert nature and superior eyesight makes it one of the best guard dogs. It was initially developed in hungry. It was historically used as royal dogs and to guard livestock. In the last 70 years, it has been drastically increased in homes as pet dogs. The breed is popular as large dogs and can be independent and aggressive, therefore, it requires proper training and socialization tenure. Talking about the appearance, it has forward folded ears that give the appearance of strength, however, the head is not coarse but somewhat refined. They are almost white breeds but the shades can vary from breed to breed. The male can reach heights of 28 to 30 inches in height and weighs approximately 115 pounds, however, females are smaller but still, they have a size of 27 inches tall and weighs around 80 pounds. This large dog was originally bred for bull and bear fighting and is a very aggressive and strong dog. It is not very social and needs to be properly trained from an early age to make it comfortable as a house pet. In open surroundings, it uses its strength and athletic ability to protect animals and land. The breed with huge muscles and wide jaws have a fierce appearance. The breed can reach a height of 40 to 50 cm and weighs approximately 13 to 18 kilograms. The breed is popular for other gentle and ductile behaviour. Taking about the history, its heritage back to the ancient Molossian war dogs of the Greeks. The breed joined the English Kennel Club in 1935 and the American Kennel Club in 1974. Have you always wanted a large dog as a pet? Large dogs come with their set of responsibility for the owner. All of them require a lot of exercises, a healthy diet, and proper grooming. So if you decide to buy a farm, which of these dogs will you choose as your companion? These are the best guard dogs in the world. Do post your comments.